Round 8 of the FIDE Candidates Tournament 2016, took place on Sunday 20th March. A bit of a buzz was starting around the chess world, with the feeling that there had been something of a change of atmosphere, that the players were beginning to stake their claims. Would this be proven true? 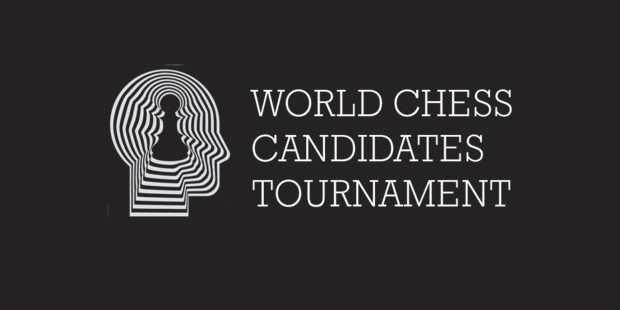 With the third rest day looming after the next round, (when only 5 rounds would remain), time was now getting to be of the essence for those who seriously wanted to be Magnus Carlsen’s challenger later this year. Hikaru Nakamura and his supporters, may have hoped that his win in the previous round (against Veselin Topalov) would signal a revival. Unfortunately, those hopes would be dashed in this round by Fabiano Caruana, who ruined the ‘feel good’ mood for them rather switly. In the Berlin Defence, Nakamura’s 10…b5 seems to be a new move, and he used it to good effect. In the opposite side castled position, Nakamura countered on the Queenside while his opponent focused his attention towards the Kingside. Both players became slightly self-absorbed, focusing on their own aspirations. In chess, this can make for very tense play, with the outcome ultimately being decided by who makes their opponent take time-out in order to deal with threats first. I think things started to sway with White’s 18.Rhg1, which is shown in the diagram, above. It is a punchy move, the rook firing along the semi-open file directly towards the Black King. Here, I would be wanting to move the King from off this masked line of attack as soon as possible. With such threats, pins, etc. it is second nature. Nakamura continued 18…bxa2 and after 19.Ka1 Bxf5 20.exf5 a3 21.b3 Na6? (21…Kh8!) From here, play led to White having the initiative, which increased when Black decided to open up the centre with 25…e4? White soon had events on the Queenside under control, and Black had problems, all the more so when his Bishop became out on a limb. Caruana had the point. Svidler-Karjakin, was an English Four Knights. White obtained a slightly better position and held some initiative with a nice advanced knight on the Queenside and dark-squared bishop firing along the a1-h8 diagonal. This was, however, contrasted by the light-squared bishop on g2, which was hemmed in by its own pawns and no doubt getting game information by carrier pigeon. Svidler’s real undoing was really weak colour complexes, in my opinion anyway, d4 and f5 stuck out like sore thumbs. And, though his setup looked quite good at first glance, with knight sitting proudly on e4 supported by a ‘V’ of pawns, it was actually quite passive and lacked real potential. Things swung vastly in Caruana’s favour. Through active defence, during which he managed to exchange his horrid g2-bishop, Svidler recovered his situation. Mistakes were exchanged in the double rook endgame, and this ultimately resulted in the point being split. An interesting game. Veselin Topalov and Viswanathan Anand got in to a Queen’s Gambit Declined, in which White (no doubt suffering some confidence issues at the moment) played rather reservedly. This allowed Black to equalise rather easily and obtain two rather nice knights, which seemed a little better than White’s two bishops. Infact, such nice, imposing pieces were they, that Topalov soon relinquished his bishop pair to get rid of one of them. This was not the only compromise, either, his pawn structure also suffered, leaving him with double f-pawns and an isolated d-pawn, which was eyed by Black’s other knight, sitting pretty on f5. When everything was put together, including that White’s dark-squared bishop was not the most active piece (sure, it fired along the a3-f8 diagonal, but this was hardly relevant), White had to be standing a little better. As it was, though, any advantage was only slight, and Anand was unable to find a way through. The players exchanged and Topalov battened down the hatches sufficiently that the point was shared. Levon Aronian and Anish Giri repeated a line, in the Semi-Slav, that they had played a month or so ago in Zurich. That game had been drawn in 37. In this game they did a little better, Aronian varying with 14.f3 instead of f4 – maybe he sneezed and let go of the pawn too early…? From here, the play focussed on the Kingside really, but the players steadily exchanged down and any potential in the position evaporated – draw in 42.